June 26, 2012 - Bechtel completes new state of the art Terminal 3 building at McCarran International Airport in Las Vegas, NV on schedule and within budget. The $2.4 billion, 1.9-million-square foot facility will open to international airlines on June 27. The construction of Terminal 3 is one of many projects Bechtel has managed for Clark County Department of Aviation. 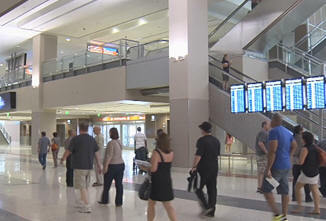 "This was the biggest expansion project ever undertaken at McCarran and it has probably been the most challenging one. Bechtel's detailed planning, regular communications, and problem-solving ability have helped to ensure the success of this project, and we are delighted that Terminal 3 will now be able to welcome even more people to Las Vegas," said Randall H. Walker, director of aviation for Clark County. New automated aircraft docking systems also allow pilots to precisely align with a passenger loading bridge requiring minimal ramp staff support. Dynamic signage is provided by more than 1,100 LCDs and LED screens which enable wayfinding, passenger information, and airline branding with up to the minute information. "Building Terminal 3 while the rest of the airport was still operational was challenging but our longstanding partnership with the Clark County Department of Aviation has been instrumental to our completion of this project on schedule," added Don Wright, Bechtel's project manager at McCarran International Airport.